New York, Tokyo, Hong Kong, and Paris: this is Chanel’s world Grand Tour for the launch of its last ladies’ timepiece: the J12 XS. A small, tiny timepiece, exhibiting a diameter of just 19 millimeters but enough to encapsulate all the magic and the complexity of a collection that has become a cult watch. 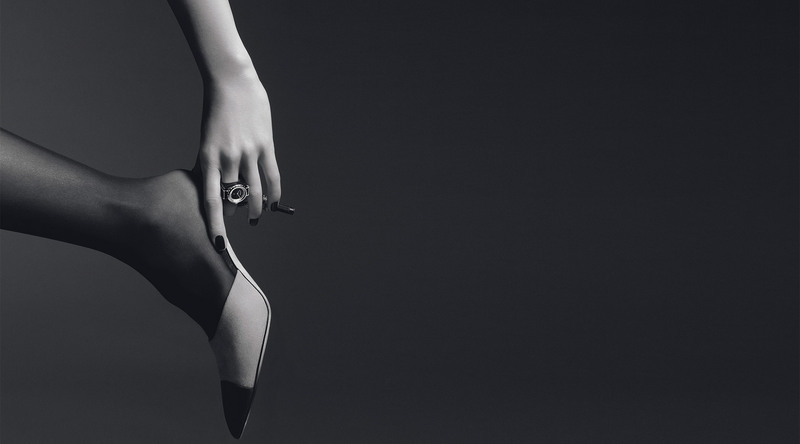 The name of the watch, XS, is a play on the initials that stand for its “extra-small” size, as well as for the whimsical word “excess”, that perfectly renders the extraordinary side of a watch model that brings into question all the beliefs that many – perhaps too many – people had about contemporary ladies’ timepieces. Pictured above two J12 XS Noire watch versions. On the left, a patent calfskin strap worn over a matching matte calfskin cuff. 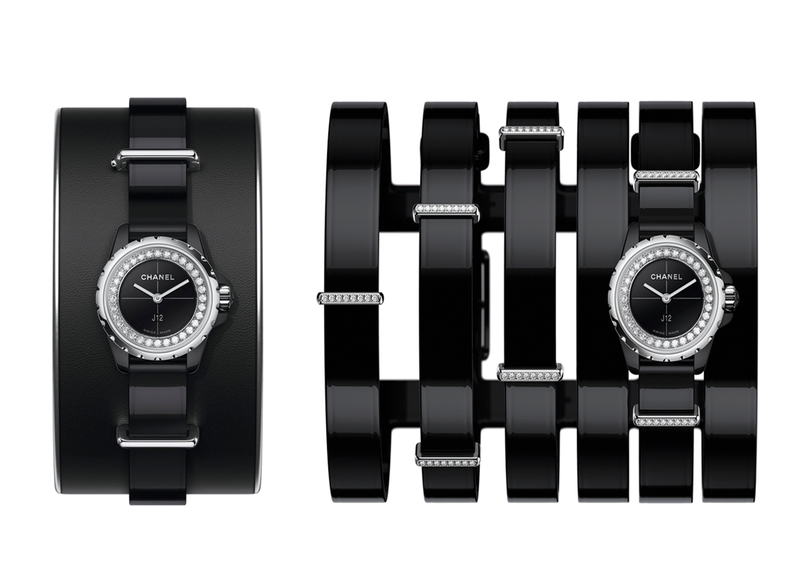 On the right, the large slave bracelet version exhibiting six slim black patent leather straps mounted with the watch dial and mobile steel loops embellished with diamonds. Both models display black lacquer dials and are equipped with high precision quartz movements. As a matter of fact, nowadays it seems that quite a lot, if not almost all, the ladies have chosen to walk the same gentlemen’s path. Watch cases featuring an extra-large size, starting from 43 millimeters, have become by now quite customary. At the same time, it is not so unusual to see ladies’ wrists adorned with massive gentlemen models. Conversely, the history of fine watchmaking remembers us that the finest ladies’ timepieces, manufactured between the ’40s and the ’50s, seldom exceeded 25 millimeters cases. The watch cases featured stark and simple shapes, yet were usually made from precious metals, and further enriched with diamonds or other coloured gemstones. Above a charming and exquisitely elegant white bracelet cuff version of the J12 XS Blanche collection. Chanel presents an all-new iteration of the J12 family, the last brainchild designed by its late artistic director Jacques Helleu. And, it comes in many alternative versions. In fact, it can be worn as a ring, on a leather calfskin bracelet, over a pair of gloves exclusively realized for this collection, or mounted onto a slave leather patent bracelet entirely hand made by the maison Lesage, which since 2002 is part of the Métiers d’Art Chanel. Here above, another alternative way is to wear the watch over black lambskin fingerless gloves. Clearly, a nod to Chanel‘s creative director Karl Lagerfeld. Limited Edition of 150 pieces. Above J12XS Black Lesage Cuff version. Black high-tech ceramic 19 millimeter case housing a black lacquer dial further enriched with 32 brilliant-cut diamonds, and powered by a high precision quartz movement. It can be worn with or without the cuff. J12XS Watch High Jewelry Ring realized in one unique piece. 18K white gold 19mm watch case displaying onyx-made dial and adorned with baguette-cut diamonds and high-tech ceramic, and equipped with a high precision quartz movement. No matter the version, the result will be absolutely unusual and captivating. And above all, destined – yet again – to mark the time of the future fashion trends.